In the background of modern life, as people go on debating politics and working for a living, something dreadful is happening to the eco-systems which support us. Major disasters like the ongoing radioactive leak at Fukushima, the apocalyptic fires burning throughout Indonesia, even bee colony collapse disorder, seem to fall out of view in day-to-day life, as we seem to have lost our power and will to directly participate in the stewardship of planet earth. A new crisis is now happening all around us affecting trees. It appears that millions, hundreds of millions even, of trees are dying in North America and around the world from a basket of reasons, promising to completely and permanently alter the landscape and environment around us. A New York Times feature on trees in California warns us that many of the state’s trees were already dead before forest fires moved in, thereby making the fire situation worse. Many of the tree deaths in Northern California have been linked to Sudden Oak Death in addition to an ongoing drought, but, the tragic die-off of trees is far from limited to California. In 2010, Hawaii’s well ohi’a trees began to die on the Big Island due to a disease now referred to as ohi’a disease, and scientists still don’t understand its origins or how to treat it. These are just a few examples of many in a wave of issues killing trees in many parts of America and around the world. Entire mountainsides are dying off in short order, leaving a bleak future for wildlife and residents. 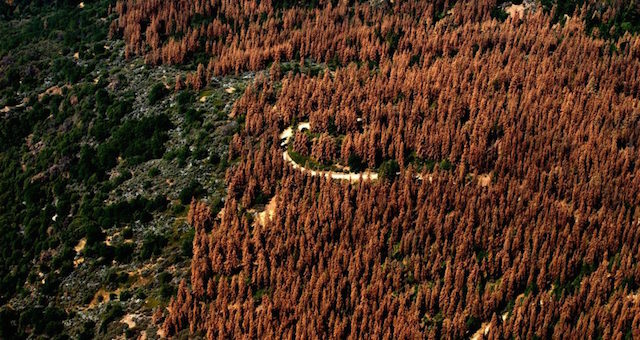 Some speculate that the widespread loss of trees due to such a wide conflagration of issues is a sign that trees, the most rugged of all plants, are in general weakened from an environment under complex attack by pollution and even climate engineering projects. Could be, although there is nothing like a consensus on the issue of why trees are in such a weakened state that so many are succumbing to so many issues. 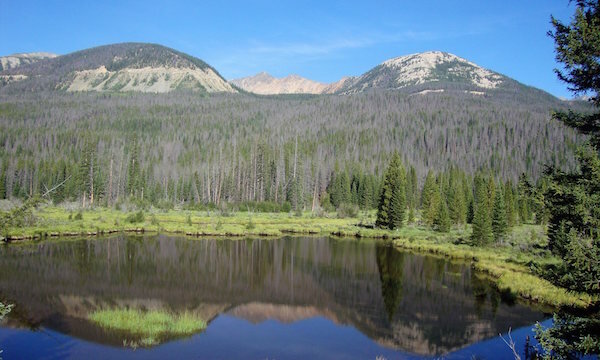 Thousands of trees killed by mountain pine beetles in western Rocky Mountain national park. The web of life cannot be damaged in one area without the effects being felt elsewhere. Just as bees and other insects are dying off en masse by a number of causes, some known and unknown, trees are also harbingers of the health of our planet. With such little attention given to the state of this earth and so much attention given to the human and political dramas that occupy our attention 24/7, will the human race wake up and react in time to avert a major planetary crisis? What are your thoughts on this important and pressing issue? Please leave your comments below, and share this article far and wide.